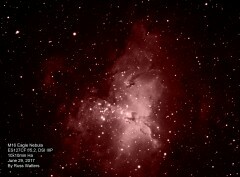 M16, the Eagle Nebula. This was taken from my new pier on the first night it was set up. It was getting late and I picked this object without much thought and only had time for one color. Somehow it turned into one of my better pics! Not without its faults, but this may be my best picture to date. 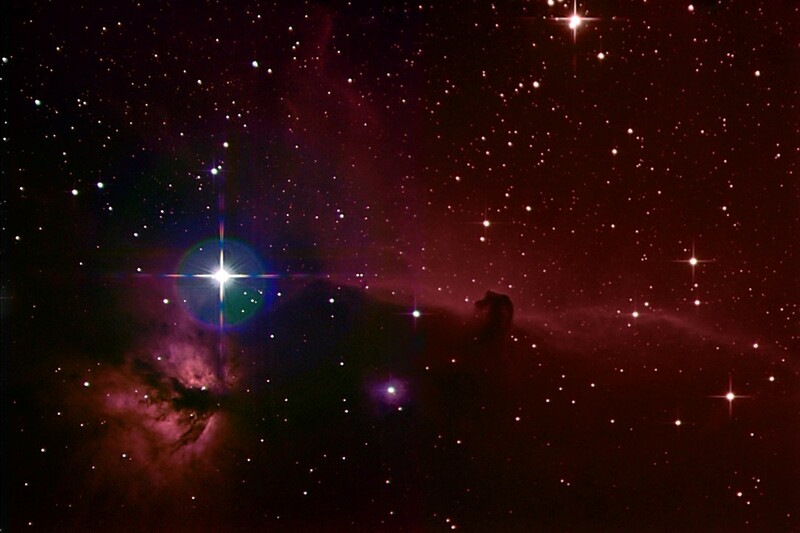 It is the Horsehead and Flame nebulas, in the constellation Orion. 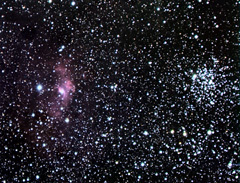 the bright star is Alnitak, the left-most of the three stars in Orion's belt. The picture is laying on its side to better fit your screen. 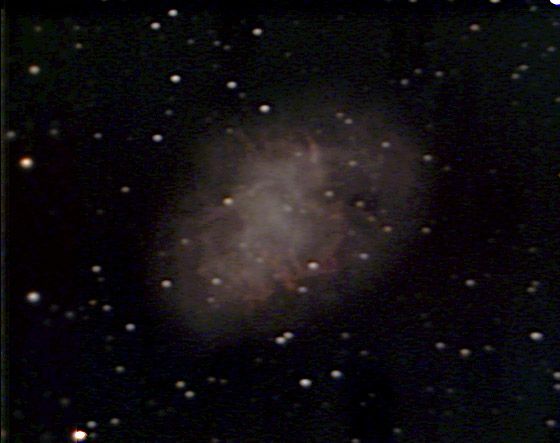 It is two panes, stitched together, each 10x2min R, 10x3min G/B, 10x3min Ha (Hydrogen's red glow) for a total of about 6hours exposure on 1/30 and 2/2/08. The image covers about 1.5 degrees (3x the width of the moon). 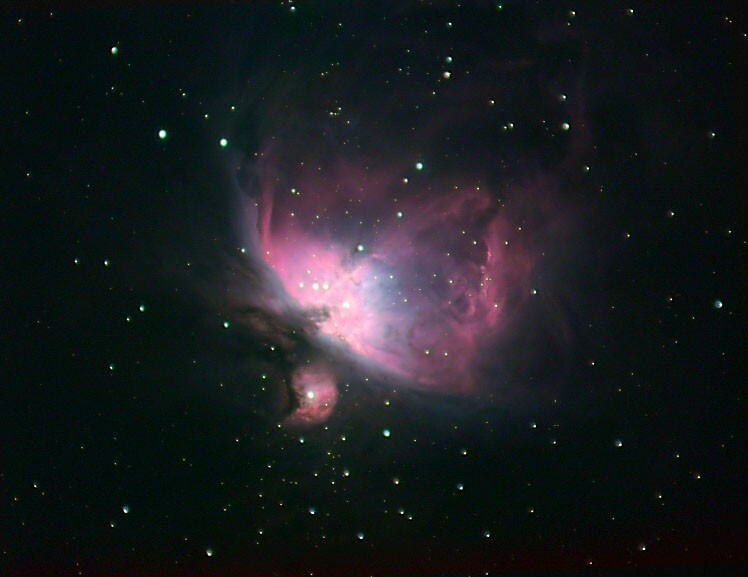 M42, the Orion Nebula. 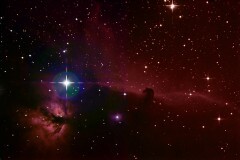 this is located in the center of his sword, with the bright area in the center looking like a fuzzy star to the naked eye. 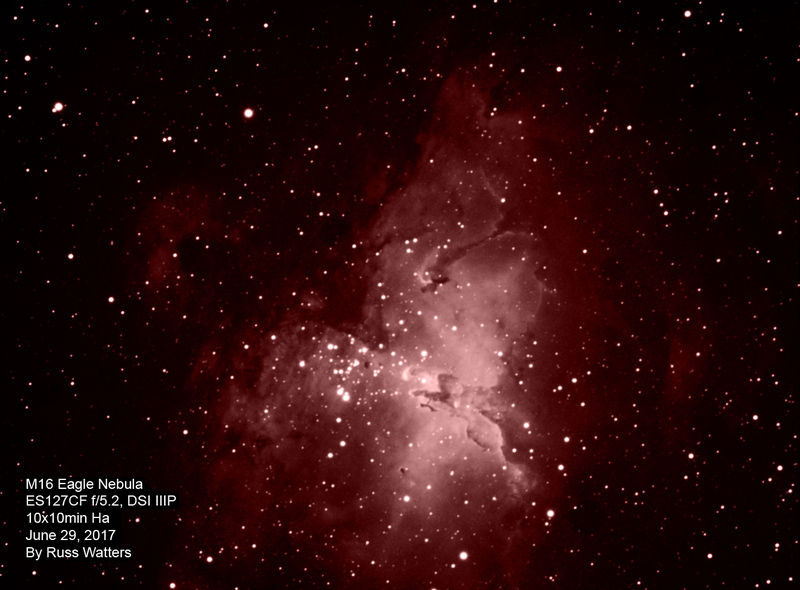 This is only about an hours worth of total exposure, 30 and 45 sec RGB and 5, 30, and 45 sec Ha. 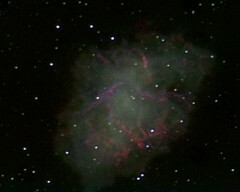 I was pleased with the result despite the short exposures and light polluted skies. 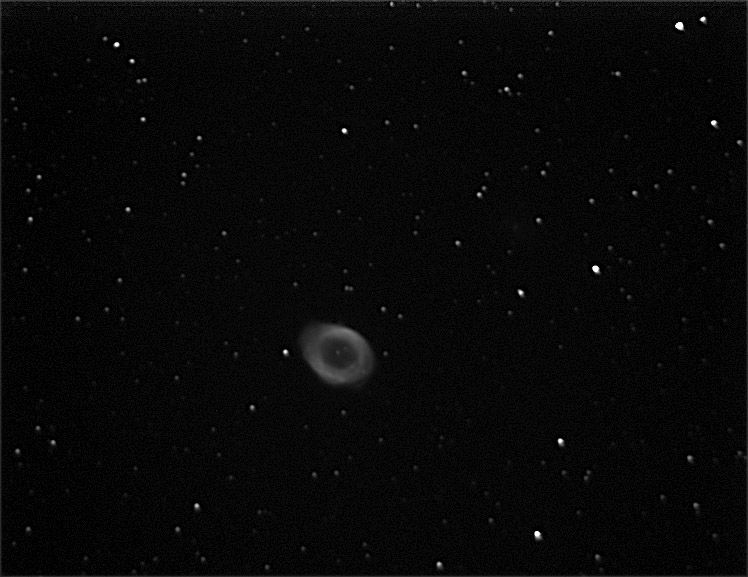 The center is a composite mixing exposures of different brightness - the first time I've attempted that. Note the focus problems with the stars. That's due to the use of a focal reducer to expand the field of view. 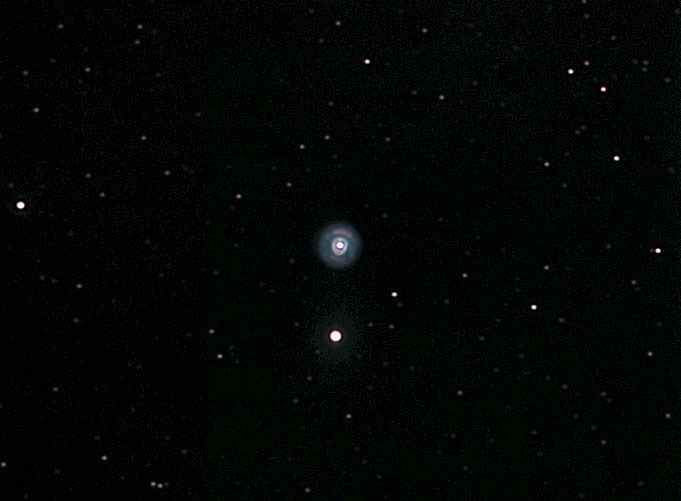 Blue Snowball (NGC7662), planetary nebula, taken 1/10/07. 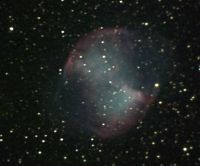 Planetary nebulae are the outer layers of stars, blown off when their heat output vaires as they die. 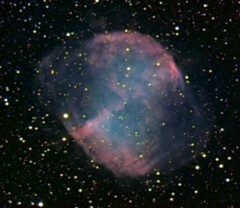 There are a lot of this type of nebula, since around 90% of all stars (including ours) will end up this way. 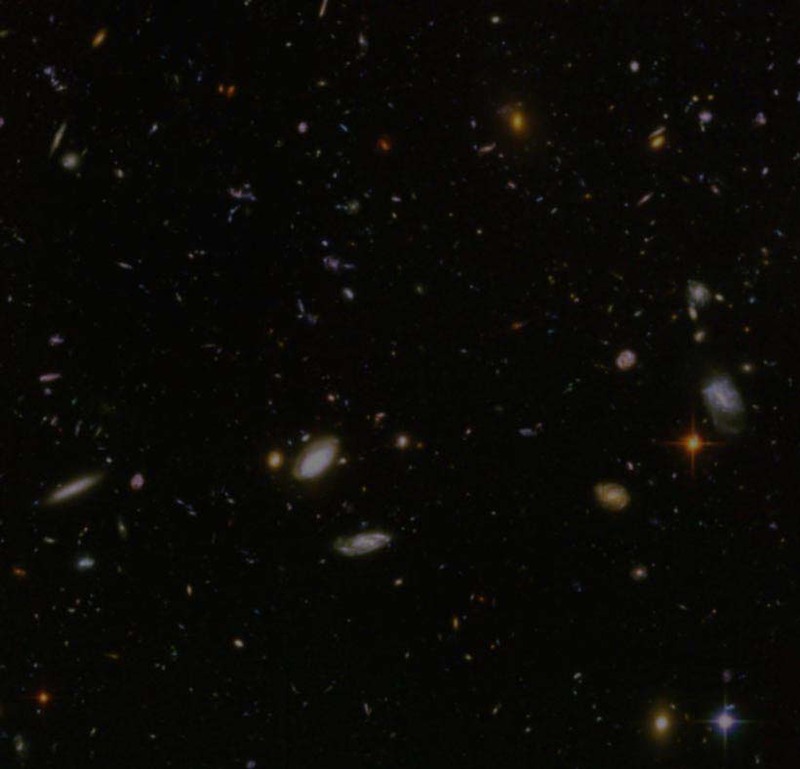 This one is about 4,000 light years away and 1,800 years old. 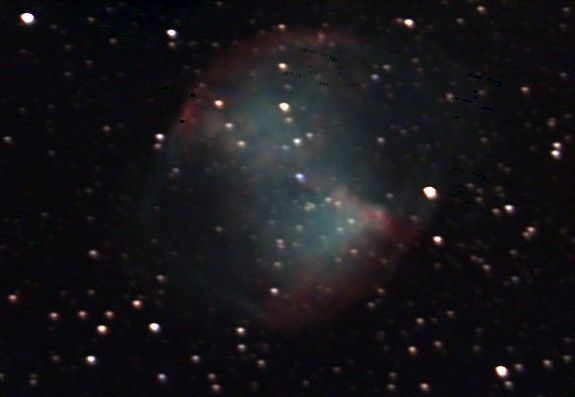 50x20s, lrgb The Clown/Eskimo Nebula, NGC 2392. 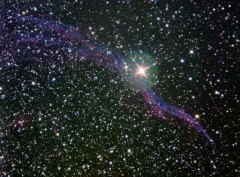 It is a thousand years old and 5,000 light years away. 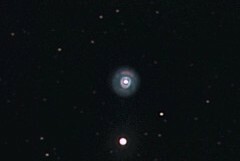 When first discovered 200 years ago, its discoverer gave it the unfortunate description "planetary nebula", because it reminded him of the planet Uranus. The name stuck, thoug these objects have nothing to do with planets. 30x30s, lrgb. 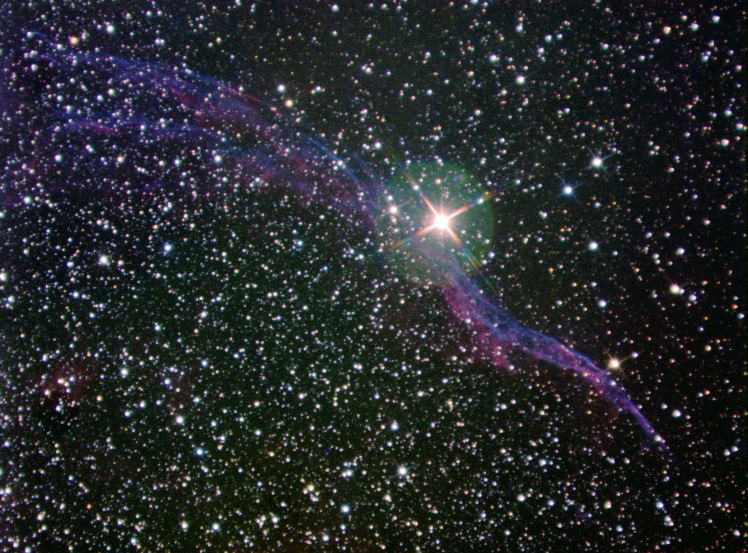 The Veil Nebula (west). 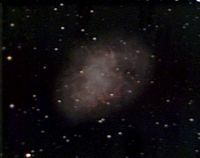 This is one half of a 15,000 year old supernova remant, 2,400 light years away. 8x4min R, 8x6min G/B. Taken 9/12/07. 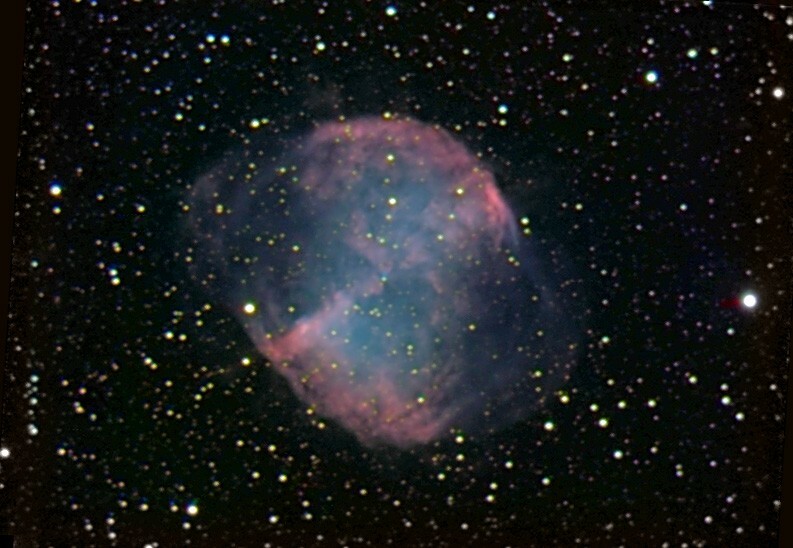 M27, the Dumbell Nebula, planetary nebula. 9/27/06 (Taken with DSI Color) M27, 11/24/06. Big improvement! And again, 6/20/07. Big, BIG improvement! 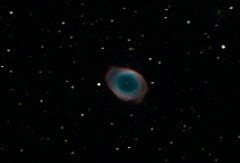 M57, the Ring Nebula (planetary nebula), luminance only. 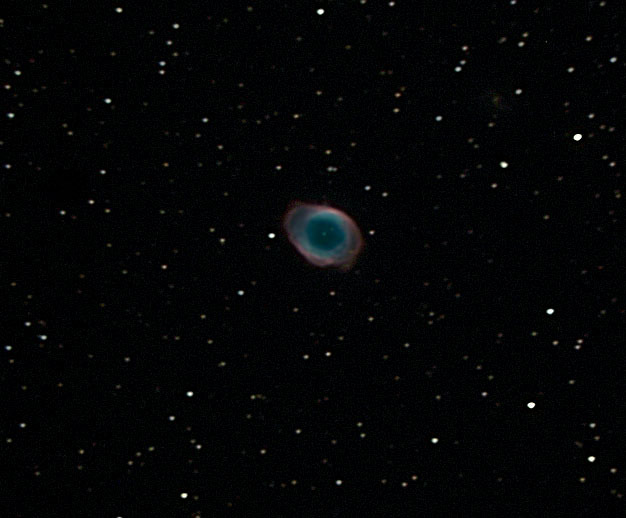 M57, the Ring Nebula. 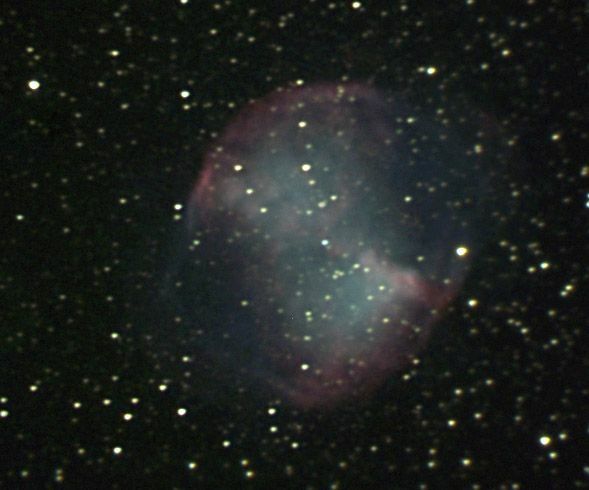 20-30 sec LRGB, 11-24-06. 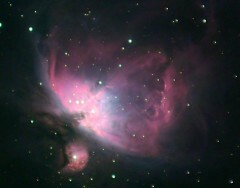 This is The Great Orion Nebula, M42, taken through my ETX-105. 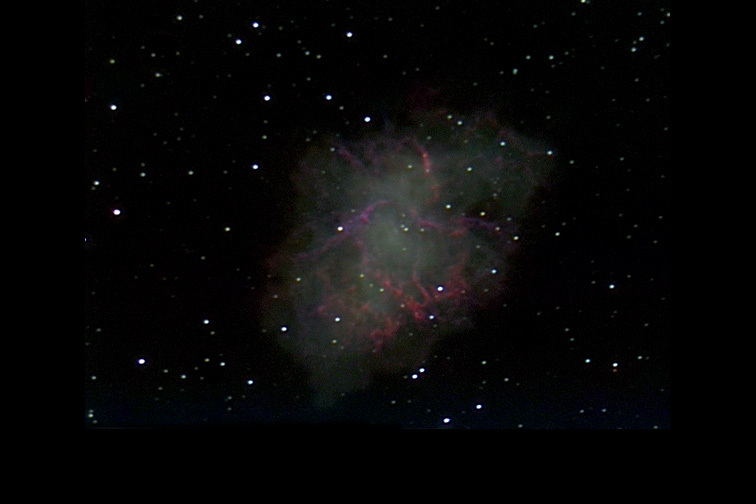 It's an enormous, backlit cloud of hydrogen gas and dust. 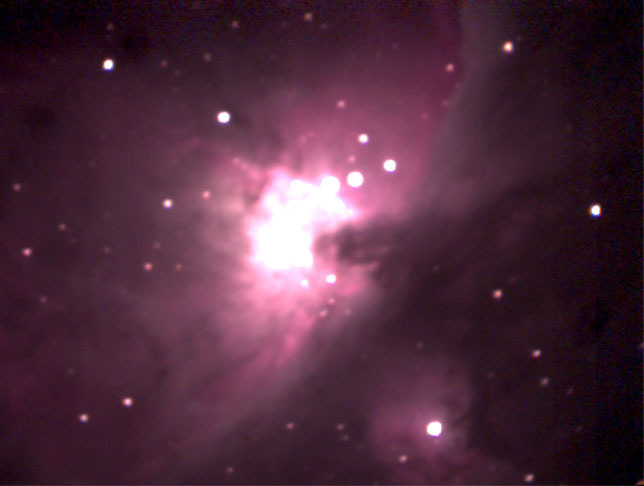 The 4 stars in the center (bleeding together here) appear as a single, fuzzy star in the middle of Orion's sword to the naked eye. This is a stack of 5 second exposures, taken 1/1/05. 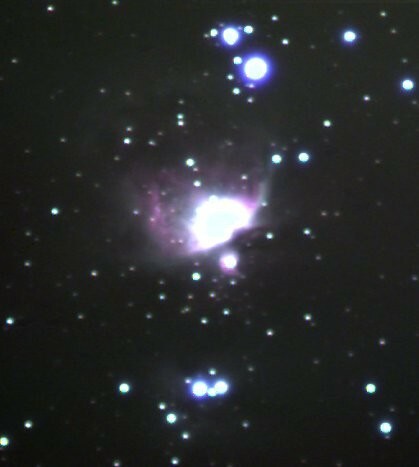 Also M42. 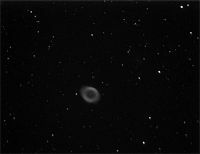 Processing of this is tough, trying to bring out faint details without washing-out the center. 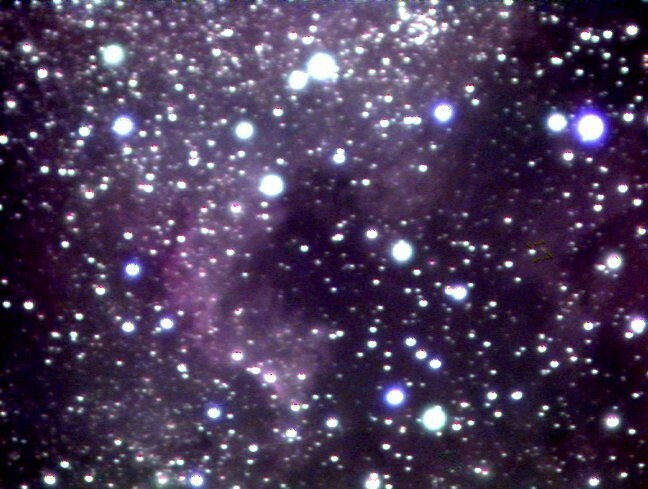 Taken 2/19/05 This is the North American Nebula, taken through my 135mm lens on 11/2/05, 90 second exposures. I'll get Canada later... 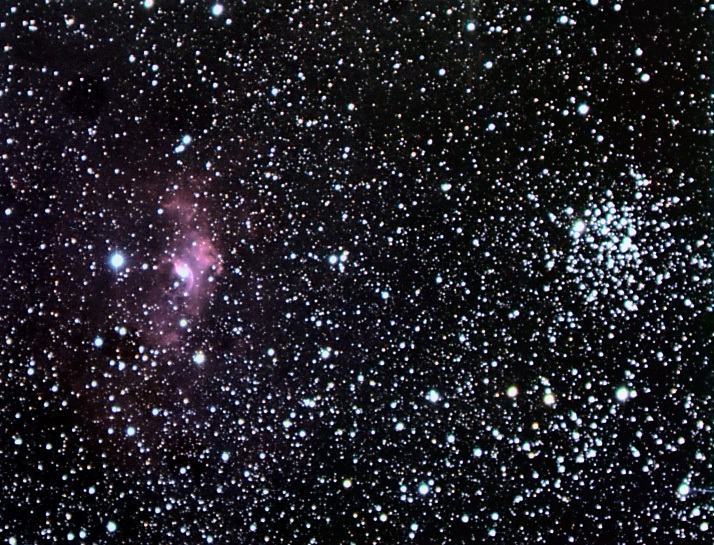 This is Orion's sword - visible to the naked eye as 3 relatively dim, fuzzy stars, but actually containing many stars and nebulae. 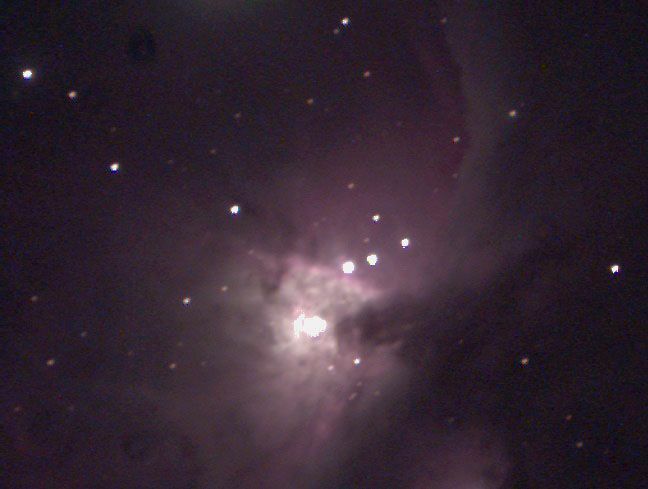 The bright nebula in the middle is the Great Orion Nebula, M42. 60 seocond exposures taken on 11/2/05.